The Network of Communications Reporters (NCR) has called on the National Communications Authority (NCA) to direct telecom companies in the country to fully comply with regulations that enjoin them to register every subscriber identification module (SIM) cards before they are activated for use. According to the NCR, the telecom companies (telcos) had allowed their vendors to break the laws governing SIM registration and were selling the cards without allowing the customers to register as prescribed by law. Samsung Ghana in partnership with Ecobank Ghana has introduced the latest mobile device from the Samsung Note series onto the Ghanaian market. MTN is injecting a total of $143.7 million into its operation in Ghana this year to improve on its services. The money would go into the installation of more 4G , 3G and 2G cell sites throughout the country and also the installation of 410 km fibre optic cables throughout the country. 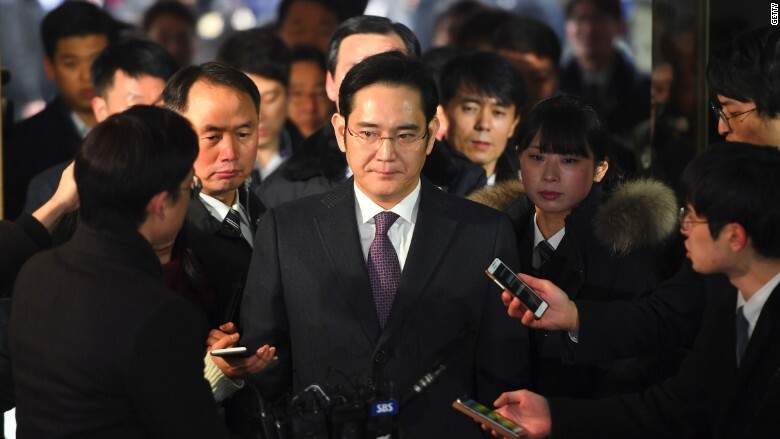 A South Korean court has found Lee Jae-yong, the de facto chief of the sprawling Samsung business empire, guilty of bribery and other corruption charges. The Minister for Communications, Mrs Ursula Owusu-Ekuful, on Monday paid a working visit to the National Communications Authority (NCA). Accompanying her were the Minister for Information, Mr Mustapha Abdul-Hamid and Deputy Minister for Communications, Mr Vincent Sowah Odotei. IT and Telecommunications solution provider, Subah Infosolutions Ghana Limited, has been adjudged the “Best Revenue Assurance, Fraud & Traffic Monitoring Solution” provider at the just-ended 4th Annual Africa Telecoms Fraud, Revenue Assurance and Risk Management Forum in Kenya. The Director of Subah Infosolutions, Mr Redeemer Kwame, accompanied by the Business Development and Marketing Manager, Mr Emmanuel Hudson-Odoi, and the Revenue Assurance Manager Mr Felix Steve Quaicoe, received the award on behalf of the company. A new smartphone, Fero L100 has been introduced in Ghana by MTN in partnership with Dubai-based mobile company Fero. The Fero L100 has a 5-inch HD IPS display with a dragontrail glass protection and a long battery lifespan. Ghanaian-owned technology company, Rlg in partnership with Adulawo Technology Company, has secured a multi-million dollar contract for the production of terrestrial broadcast set top boxes for Nigeria. A three-day International Workshop on Criminal Justice Statistics on Cybercrime and Electronic Evidence on Wednesday, 29th March, 2017 has opened in Ghana’s capital, Accra at the Movenpick Ambassador Hotel. The Acting Director General of the National Communications Authority (NCA), Mr. Joe Anokye, has charged Mobile Network Operators to work on improving Quality of Service (QoS) and ensure that consumers are satisfied. He said this at a meeting with Chief Technical Officers of the various Mobile Network Operators (MNOs) on Friday, 17th March, 2017 at the NCA Tower. Present at the meeting were representatives from MTN, Tigo, Vodafone, Airtel, Glo, and Expresso. The purpose of the meeting was to discuss poor Quality of Service (QoS) being experienced by consumers. MTN Ghana plans to spend an amount of $143 million in capital expenditure in 2017 in a bid to boost a raft of network expansion programmes aimed at delivering communication speed and improved network access. This year, the communications giant will roll out 197 4G [Long Term Evolution - LTE] site across the country in addition to the existing 275 already spread nationwide. This will mean a total of 475 LTEs in all. Chief Executive Officer of MTN Ghana, Mr Ebenezer Twum Asante said at the MTN stakeholders’ forum in Accra that the telecommunications company will roll out 561 new 3G sites across the country whilst adding 345 2G new sites to the existing one. MTN Ghana is still in the lead as far as its subscriber numbers and market share for mobile data is concerned. This year’s Ghana’s e-commerce expo will take place on Thursday, October 27 and Friday, October 28 at the Alisa Hotel in Accra. The event on the theme: “Transforming Ghana’s Online Business through Technology, Innovation and Opportunity”, is meant to showcase Ghana’s major advances in information, communication and technology (ICT). Tigo Ghana, in partnership with International NGO, Reach for Change, has launched its annual competition, the tiGO Digital Change makers Award. The competition aims at identifying and supporting social entrepreneurs with digital tools and technology to improve the lives of children across the country. The National Communication Authority (NCA) has pledged its commitment to extend internet facilities to the rural areas of the country to facilitate effective teaching and learning of Information Communications Technology ( ICT) in schools. Techno Ghana has launched a fourth generation long-term evolution (4G LTE) phone, the CAMON C9, to help improve customer experience and quicken the speed at which they can access Internet services. The country’s telecoms market leader, MTN, has pledged to continue its investment in new technology to enable its customers to be abreast of modern times. The Network of Communication Reporters (NCR) will from this year, hold a series of Information Communications Technology (ICT) forum to allow players in the industry to deliberate and discuss issues affecting the sector.